Over the year, I have been asked by many interested students whether I will conduct any class for bunga stokin. So after going through the materials I have, I decided to teach any interested students for bunga stokin class on 17 July 2010 this type of bunga telur. I will also do demo on how to make kipas organza (in case anyone still interested to do that kind of bunga telur), how to tie the ribbons into bow and how to do bunga telur gantung. On the practical part, the students will do bunga telur on bamboo stick like in the above picture and make butterfly from stokin. 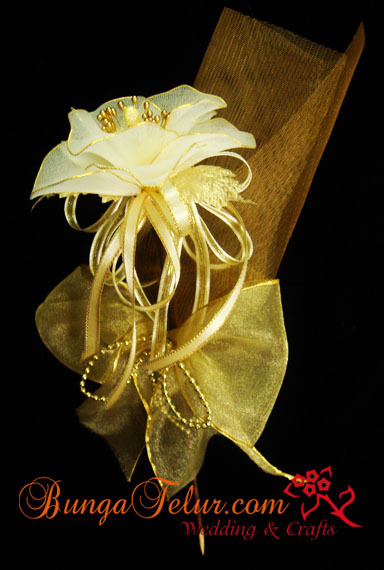 I am thinking of making the butterfly into corsage instead of teaching them to do bunga dulang mini. Come and join the class on 17th July as it is limited to 6 students. 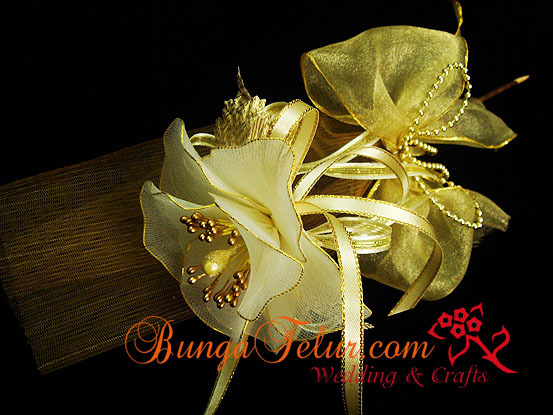 This is the first bunga stokin class I will conduct for the year 2010. 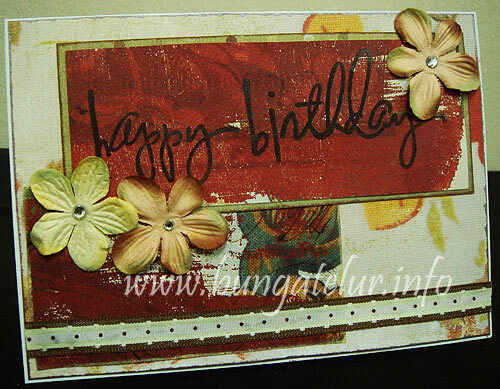 After almost 2 years of not doing any card, I decided to take part in a blog candy ran by Shirl Leong at her blog Craftee Guiri in conjuction with her husband birthday this coming 28th June. Thanks to her blog I found another blog candy ran by Scrapbooking All Sorts – which ends on June 30th. Since the requirement is to submit any latest papercraft project, I think this birthday card will do for a start. Anyway, once I have completed the card, I realized that I should have put eyelet brads on the happy birthday sentiment before I attach it to the background..huhu! Another blog candy that I am participating! Just trying my luck this month, especially since I have not indulged myself with any scrapbooking and card making stuffs for such a long time. This Callie’s blog candy is on till 19th June. So, hurry up and join the list of her followers. 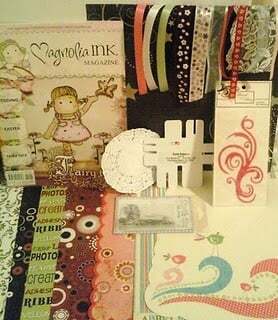 What I am interested on are the Tim Holtz Timeworks Mask, Glimmer Mist and Cuttlebug Embossing folders since those are the items that I have not bought before. My all time favorite item when crafting is ribbon. Just hope that somehow luck is on my side! Particraft Ltd is running a blog candy! They will draw the winners when they reach 900 followers. At the moment I am their 864th follower..heh! Their blog candy includes six A5 stamp sets, a non stick craft mat, a large 200ml container of clear Ultra Thick embossing powder, a Tim Holtz grungeboard set, crystal lacquer five colour set, distress ink, black archival ink pad, a large bottle of clear crystal lacquer, a distress crackle paint, an Adirondack ink pad, Cosmic Shimmer embossing powder set, Cosmic Shimmer watercolour set, a mounted stamp, cosmic shimmer glue, and fancy pants buttons. Those are the items that I still don’t have in my scrapbooking and cardmaking stash, so now you know why I am so keen on winning. Let’s join the fun, and who knows you might be the lucky one! I was reading a fellow crafter’s blog when I saw a pretty butterfly she tatted. 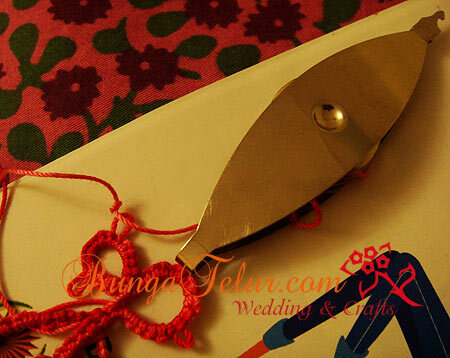 I’ve never heard about tatting before so I browsed and read through whatever I could find online about tatting. First of all, you need to have a tatting shuttle. So a trip to Art Friend the other day made me bought a shuttle by DMC. Later I found out that there is another shuttle brand Clover sold at Maycraft. The shop is located in Taipan USJ. Will be visiting the shop one of these days..heh! The funny part was once I bought the shuttle and a ball of thread, I have no idea how to wind the thread onto the bobbin. It took me the whole night to figure out that you can actually push the bobbin from the middle of the shuttle out, wind the thread and push it back inside the shuttle..huhu! And it took me another 2 days to figure out how to do the basic of double stitch, a picot and a ring. Somehow it is harder when you are self taught. 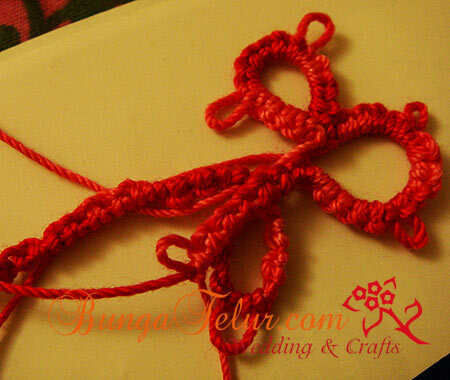 I usually will go for a basic class for any new art and craft that I want to learn. It is easier when you have an instructor to ask every time some doubt or confusion arises. Despite that I am thankful that there are many tatters out there who are willing to share via blog and videos on Youtube. I hope once I have mastered the basic techniques of tatting, I would be able to share in this blog so that other beginners in tatting will not waste so much time like I did learning the basic.